Hajós is located on the northern border of Bačka. The village was the first German settlement on archiepiscopal territory which was almost only settled with Swabian people in 1722. Until 1731, approx. 110 German families lived there, a number that was already doubled in 1770. The largest part of the Catholic settlers came from the area of Obermarchtal, Zwiefalten, Riedlingen, Mengen, Saulgau and Biberach. They built a parish church in 1728 which was enlarged later. Anna Maria Hall was a migrant from Germany. She had travelled 1000 km from Uttenweiler to Hungary and brought a statue of Mary to Hajós from the pilgrimage church on Mount Bussen. It is said to have worked wonders on the strenuous journey. Today, it can be found in a corner of the main altar of Hajós’ church which was listed as an official place of pilgrimage by Pope Pius VI in 1794. A replica of the statue can be found in the church on Mount Bussen near Uttenweiler. The main celebrations are held on the Sunday of John of Nepomuk. Hajós long kept an old pilgrimage ritual. The Miraculous Madonna is robed and embellished with a crown. In 1988, the statue was restored to its original gothic form and has not been robed anymore afterwards. Next to the church a Calvary can be found. Many baroque monuments can be found in Hajós. The most important one is the former archiepiscopal hunting lodge Jókai, which was finished in 1739. It was used as an orphanage in the 20th century. The building was refurbished and reopened in 2010 as a protected monument and museum. In the lodge’s café, copies of the German quarterly “Batschkaer Spuren” (Bačka Traces) can be read for free. Hajós is not only known for its religious treasures and monuments, but also as one of the largest cellar villages in central Europea with approx. 1.200 cellar houses. Archbishop Csáky committed the first settlers to cultivate wine and to give him the tenth of their income. Various red and white wines were grown in the region, such as Cabernet Franc or Zweigelt, but also Welschriesling and hippocras such as the Hungarian Cserszegi fűszeres. On the day of Saint Urban on the last weekend of May, the village holds its wine festival. During the festival, not only the wine cellars are opened for visits, but a rich cultural programme is offered as well. 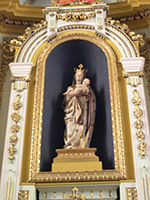 LEFT: Statue of Mary with Jesus in the church of Hajós. 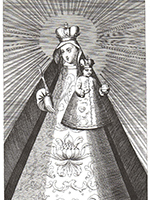 RIGHT: Drawing of the Holy Mary of Hajós. 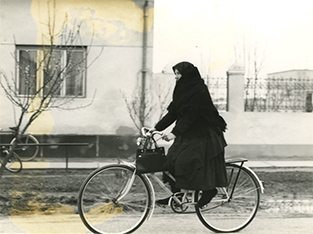 A woman on her way through the village.